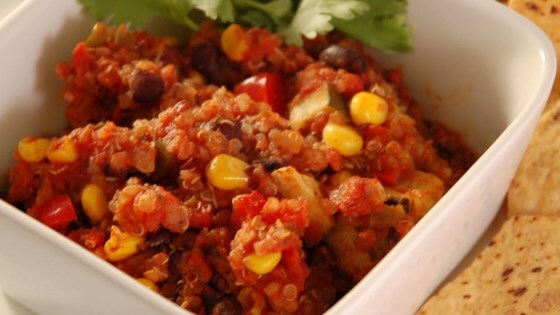 "Vegetarian chili with quinoa. Sprinkle cheese on top to serve." Bring the quinoa and water to a boil in a saucepan over high heat. Reduce heat to medium-low, cover, and simmer until the quinoa is tender, and the water has been absorbed, about 15 to 20 minutes; set aside. Meanwhile, heat the vegetable oil in a large pot over medium heat. Stir in the onion, and cook until the onion softens and turns translucent, about 5 minutes. Add the garlic, chili powder, and cumin; cook and stir 1 minute to release the flavors. Stir in the tomatoes, black beans, green bell pepper, red bell pepper, zucchini, jalapeno pepper, chipotle pepper, and oregano. Season to taste with salt and pepper. Bring to a simmer over high heat, then reduce heat to medium-low, cover, and simmer 20 minutes. After 20 minutes, stir in the reserved quinoa and corn. Cook to reheat the corn for 5 minutes. Remove from the heat, and stir in the cilantro to serve. Best veggie chili ever. Nice served with fresh avocado and lime.